A vibrant rainbow started the week off right amidst all the rain. What a beautiful sight right behind our home! 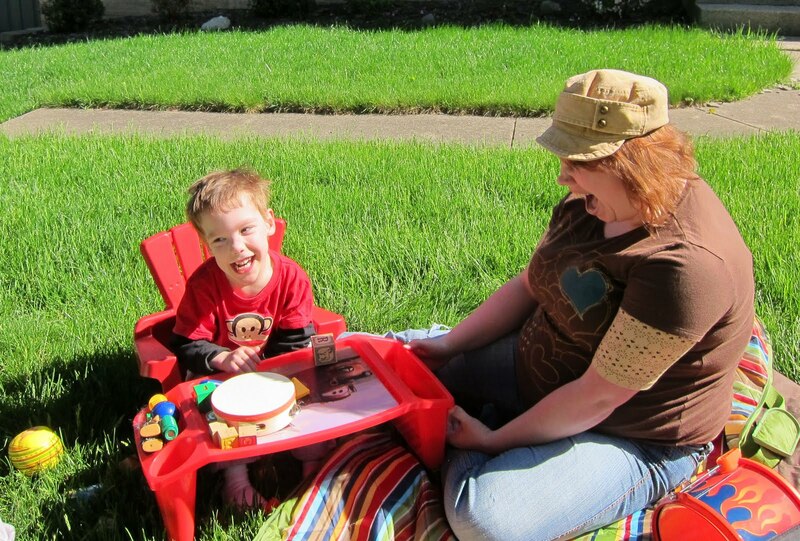 Outdoor weather eventually prevailed for Cameron as he and nanny, Lisa ventured outside for some playtime. Loaded up with toys and a picnic blanket, it was great to play in the sunshine. Another activity included a different perspective of the front yard from a branch view in the red maple tree. Cameron's highlight of the week, though, came in the form of an early Father's Day gift that Jane found for Chris. A very comfy bike seat for Cam that Chris installed on the back of his bicycle provided a whole new form of transportation! Cam and his dad surprised J ane on Monday by biking over to the gym to see Jane in her zumba class. Chris had not intended to ride that far with his big boy, but Cam kept saying "more" "more" every time Chris tried to pull in the driveway. Looks like the family will be doing quite a bit of biking this summer! !